Is your child a budding rock star? Perhaps they can drum up some fame and fortune! Drums have been a part of many different cultures throughout history. 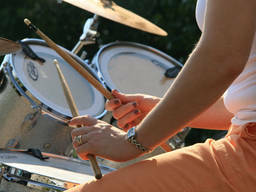 Beating out a rhythm with sticks or hands can be part of an organized group music event or can be done solo. For kids, drumming can be a satisfying and fun way to develop their musical skills and release some tension! Watch this video for the first step of your kids in playing drums. You will see that they can start young with basic movements, and then improve faster while they get older. Will Your Kids Enjoy Playing drums? Does your child like to tap out a beat on the table or any other available surface? Why not channel their interest into playing the drums? The drums are a percussion instrument and the backbone of any band or orchestra. Drums can be found in virtually every type of music so whatever music your child is interested in, they will almost certainly be able to play. One downside – drum kits are noisy so if you live in confined quarters or have sensitive neighbours you might want to find an alternate location for practice or a more peaceful pastime than drums for your child. It’s never too young to learn to play the drums! Give your toddler a set of upside down pots and a wooden spoon and watch them have fun! Young children who show an interest in playing drums can start with an electronic toy type drumkit and progress to a scale down pro model with pedals. Your child will also need drum sticks. If you find you end up with a serious drummer on your hands, creating a dedicated soundproof area for playing the drums could be a good idea! How Can You Organise drums for Your Kids? Drums lessons will probably be available from your local music school or you can check on our ActiveActivities Directory for a class in your area. Some schools teach drumming as part of their music curriculum. Once your child has learned the basics they can get involved in other musical activities for kids including bands and orchestras and they might enjoy performing in a group. Other kids’ activities drummers might enjoy include singing, dancing and playing other percussion instruments like Djembe. Search the Performing Arts section of our ActiveActivities Directory for comprehensive details of alternate musical instruments to see what may interest your child. Who knows, maybe you will see your child at the Arias one day!